Leasho Johnson is one of four artists featured in We Have Met Before, an exhibition staged in partnership with the British Council. The exhibition is on view from September 22-November 4, 2017. Leasho Johnson was born in St James, Jamaica, in 1984. He attended the Edna Manley College of the Visual and Performing Arts, where he obtained a BFA in Visual Communication in 2009. He is a founding member of the Dirty Crayons collective, which held local group exhibitions in 2012 and 2013. 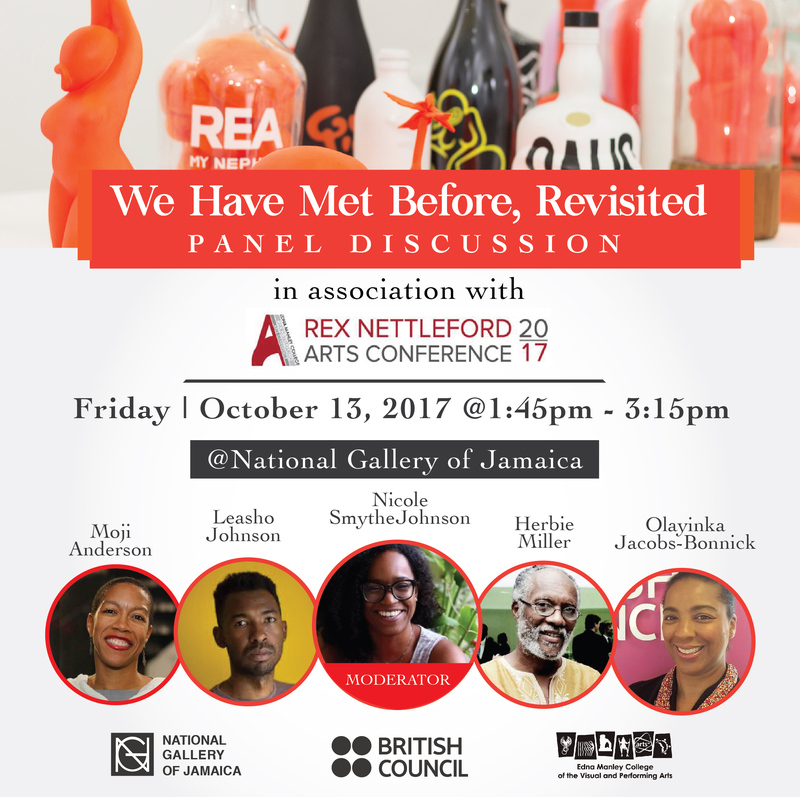 Johnson’s other exhibitions include Young Talent V (2010, National Gallery of Jamaica); Jamaican Pulse: Art and Politics from Jamaica and the Diaspora (2016, Bristol, United Kingdom); and the National Gallery of Jamaica’s Biennials since 2010. He has also participated in a number of artist residencies. In 2016, he participated in an artists’ residency at Bluecoat, a contemporary arts centre in Liverpool, United Kingdom, and he was awarded a residency at Residency Unlimited in New York City by the Davidoff Art Initiative. 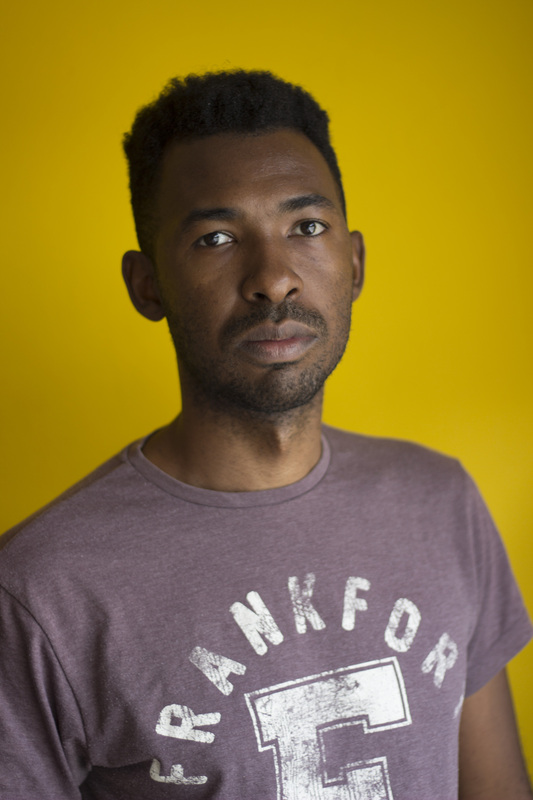 Johnson works in various media to explore the tensions and contestations in Jamaican culture and society, particularly in dancehall and its associated tropes. He resides in Kingston, Jamaica. Leasho Johnson is the youngest artist in We Have Met Before and presents a visually and conceptually explosive mix of history and contemporary popular culture, with strong references to Dancehall and graffiti. Like the other three artists, he often uses historical source material – visual material in his case – but forces this into a dialogue with a repertoire of cartoon-like female and gender-ambivalent figures in various provocative poses, other recurrent characters such as fighting and copulating dogs, and sexual metaphors such as bananas, sugar cane, palm trees and fish. In some of his recent work, drowned bodies with provocatively placed palm tree extensions become sexualized tropical islands, reminiscent of the violent histories of the Caribbean archipelago. Johnson examines the politics of sexual objectification and the contradictions of gender and sexuality in contemporary Jamaican culture and not only points to the roots of these issues in the histories of colonization, slavery, exploitation and social inequality, but also acknowledges their revolutionary potential in the present as an agent of social change. 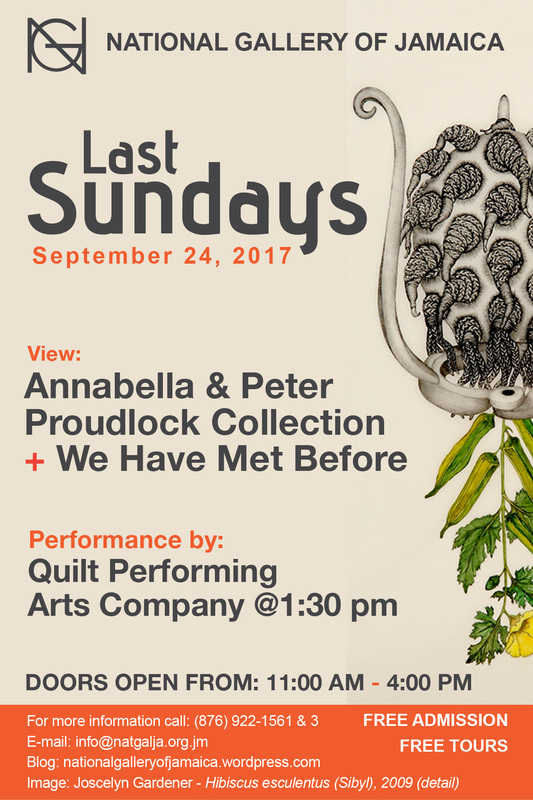 The National Gallery of Jamaica’s Last Sundays programme for September 24, 2017 will feature the Quilt Performing Arts Company. Visitors will also be able to view the We Have Met Before and the Annabella and Peter Proudlock Collection exhibitions. 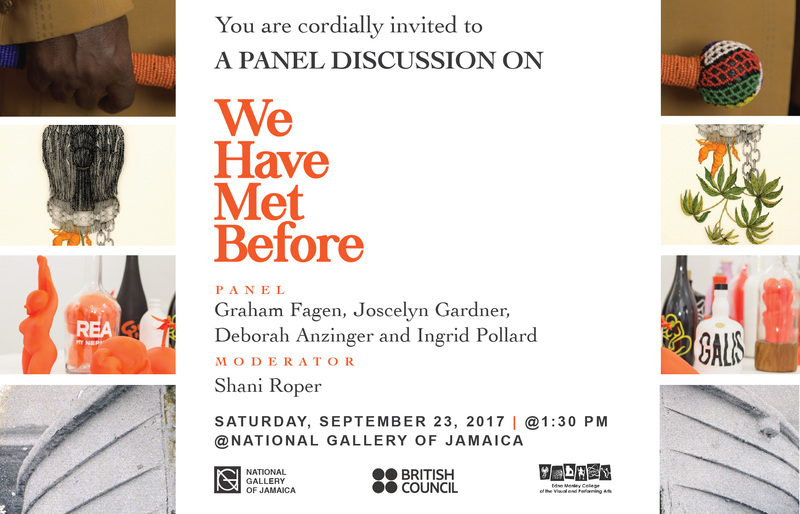 Joscelyn Gardner is one of four artists featured in We Have Met Before, an exhibition staged in partnership with the British Council. The exhibition is on view from September 22-November 4, 2017. 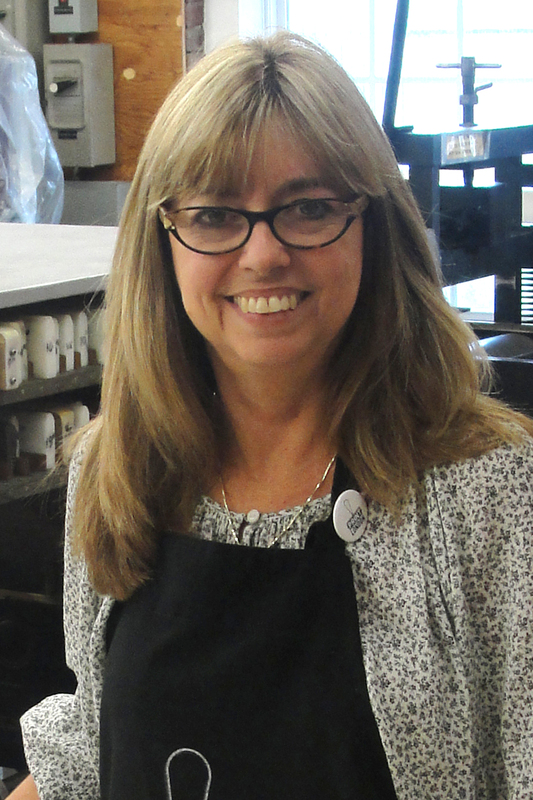 Born in Barbados, Joscelyn Gardner works both in the Caribbean and in Canada, where she is Professor of Art at Fanshawe College. She has held solo exhibitions in the USA, Canada, Spain, and throughout the Caribbean and has participated in numerous international biennials, exhibiting both prints and multimedia installations. 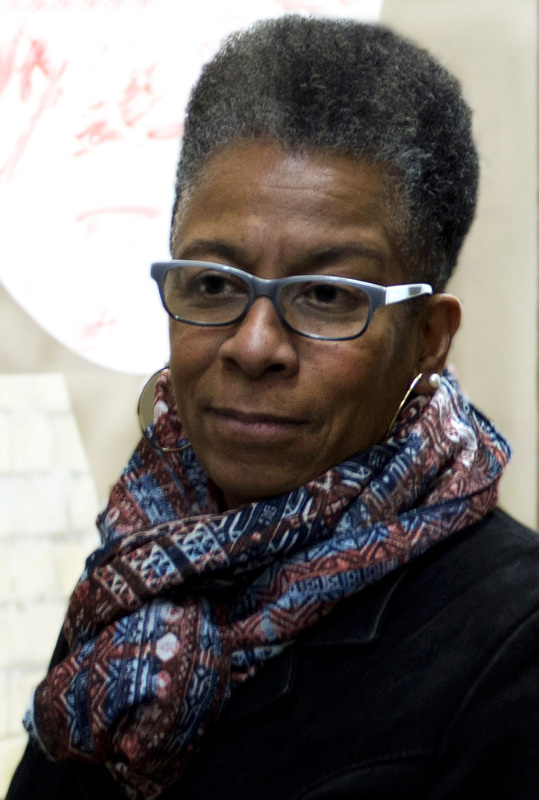 Her work has also appeared in curated group exhibitions at museums in the USA, France, Puerto Rico, Martinique, Spain, India, China, Barbados, and the Netherlands, and is in public collections in the USA, Europe, and the Caribbean. In 2013 she received the Grand Prize at the 7th International Contemporary Printmaking Biennial in Trois Rivières, Quebec. She holds an MFA from Western University, and a BFA (in printmaking) and a BA (in film) from Queen’s University. Joscelyn Gardner is represented by two full series of lithographs – Plantation Poker (2004)and Creole Portraits II (2007)—and a selection of lithographs from the Creole Portraits III (2009- 2011) series – which are exhibited as installations that also include other elements. In these prints, which conform to the conventions of natural history illustrations, intricate African braided hairstyles morph into the instruments of torture that were used during slavery. A more specific reference to sexual abuse is added in the imagery in Plantation Poker, where the triangular shape of the hair references female pubic hair. The lovely flowers in Creole Portraits III are plants that were used by enslaved women to secretly end unwanted pregnancies. While deceptively delicate and exquisitely beautiful, the prints powerfully invoke the dehumanizing cruelty of plantation slavery. Gardner’s body of work is inspired by the infamous diaries of Thomas Thistlewood, a plantation overseer in Jamaica in the mid-18th century, who recorded with scientific precision his many forced sexual exploits and the cruel punishments he inflicted on the enslaved.